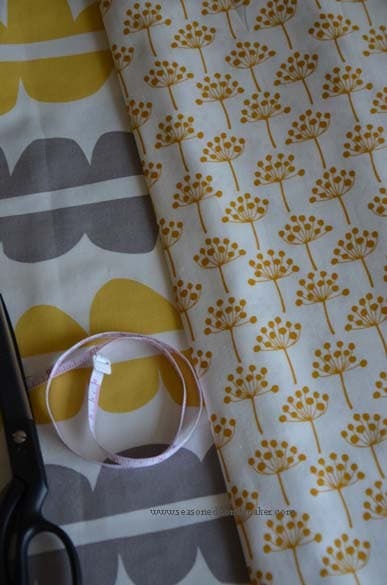 Choosing the right fabric can make all the difference when making your own apron. 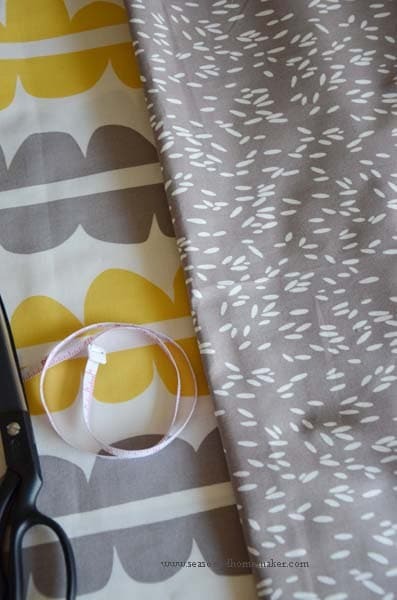 Here are a few tips and things to consider so you can choose the best fabric for your next apron. It’s safe to say that I have spent a lot of time matching fabrics to aprons. And, with the holiday season closing in on us, I wanted to give you a quick tutorial about choosing fabrics for aprons. 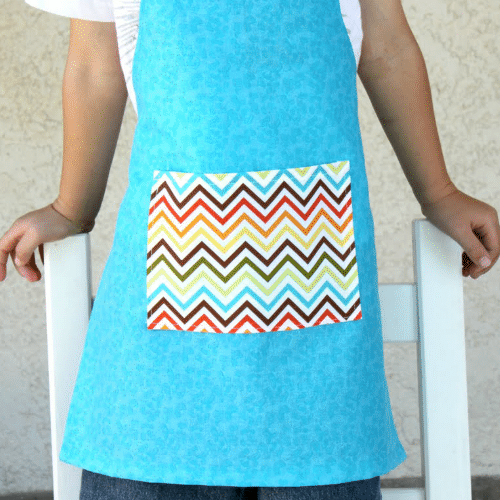 Because we all know that aprons make great gifts. 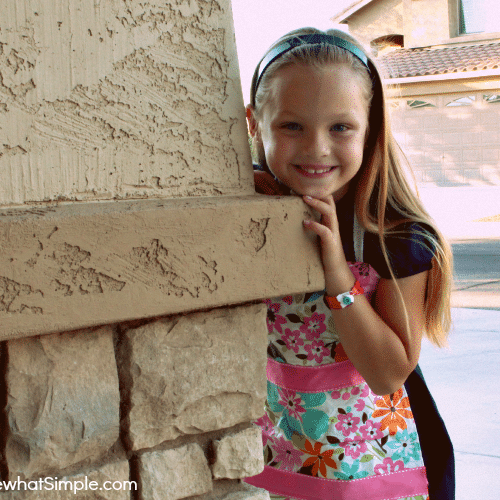 Today, I am going to show you how I go about putting two fabrics together to create an apron that I will love. 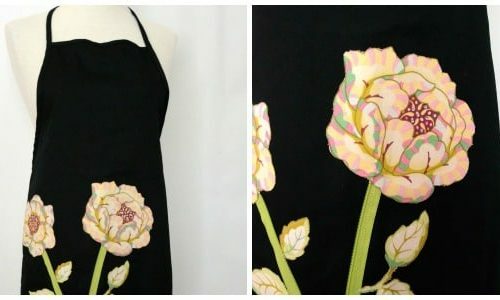 If you follow closely, you should be able to do the same and create beautiful aprons for yourself or as gifts. For aprons, I ALWAYS use a 100% cotton in a quilting weight from a quality fabric manufacturer. A few examples would be Michael Miller, Windham, and Moda. The process begins with me being drawn to a particular fabric. It may be the color or design. In this case, I love both. The combination of yellow and gray still excites me, so the colors are perfect. I am also drawn to the modern design in the print and the fact that it is a stripe. Another thing to consider is the size of the design. Since I want a large print for the apron skirt, this fabric works perfectly. 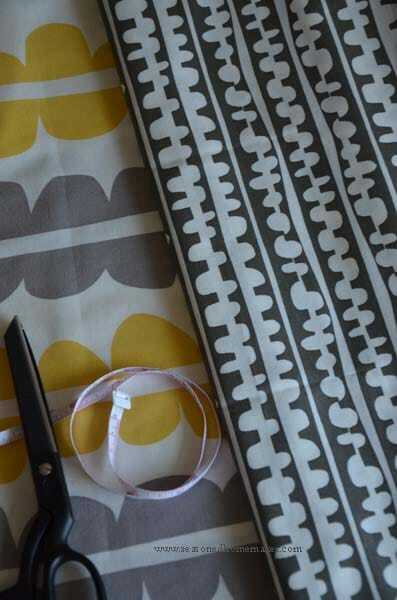 Decision made; I’m going with this fabric from the Echo Collection by Windham Fabrics. Besides, I’m a huge fan of the designer, Lotta Jansdotter. The next step is choosing a companion fabric. Since this fabric is part of a collection I will want to see what fabrics are available and start there. From the same line, I tried this smaller gray and white print. I’m not really in love with it because it looks like chicken feet, but it would definitely work. However, I’m going to keep looking. My second try was another fabric from this line, but this time I used a different design that will pull out the yellow in the fabric. Technically, this fabric works. The print is smaller than the one that will be used in the skirt and the colors go together well. When I put them together they just don’t work for me. The skirt fabric has a lot of white and so does the dandelion fabric. If I used this in an apron it would be too bland. 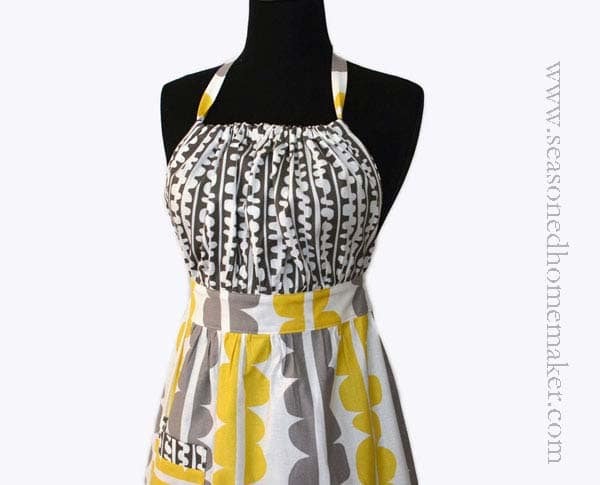 Since I want my apron to be on my pattern’s cover page, I’m thinking bland won’t work for me. Third try. 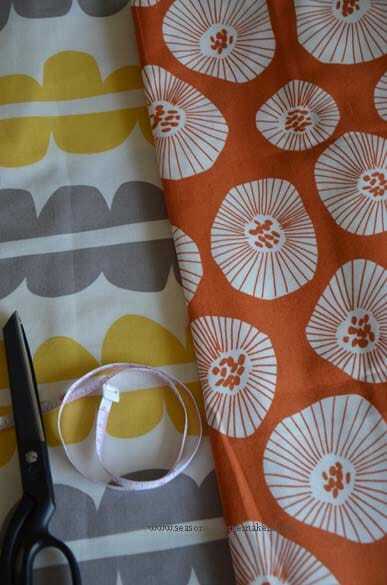 Again, I went with something from the fabric line, but this time I went with a large print on an orangey background. I love the orange print, but not with the gray and yellow. If these were pillows in my living room it might work, but not for an apron. I will use the orange fabric elsewhere since I really like it. Fourth try’s the charm. The minute I put these two fabrics together, I knew that I would like them in an apron. The gray and white print is a smaller version of the skirt print. The gray is a little more saturated color so it will stand out some. Also, I like that it is a stripe. 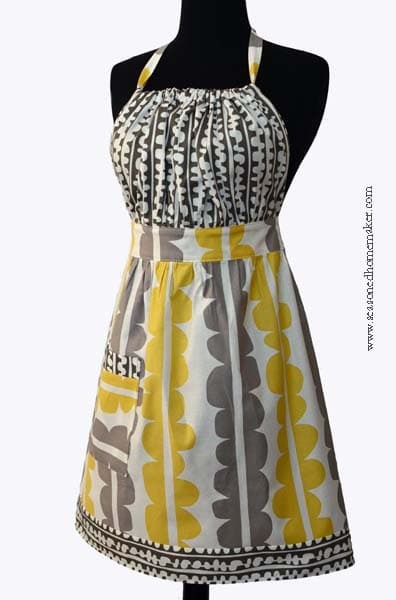 With the Urban Chic Apron Pattern I need a fabric for the bodice top and also for the hem band. This fabric gives me the option of running the stripe in a different direction at the hem. Notice how I ran the bodice and pocket band in the same direction, but the hem band and the pocket are running in different directions. This is why I like the striped nature of this design. I gives me options with the pattern. 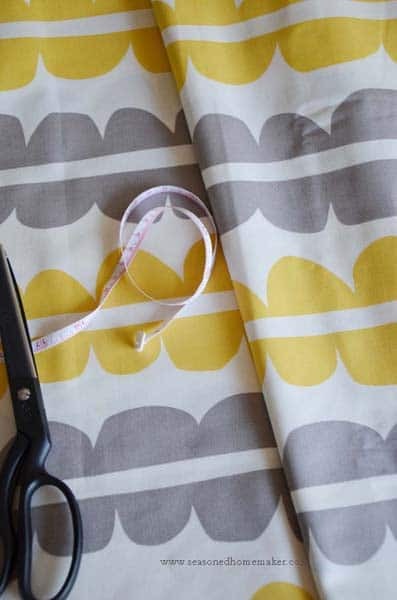 Matching fabrics with patterns really is easier than you think. I loved your article, but I have a difficult time finding good places to purchase fabrics like the ones you’ve shown. Finding fabric can be tricky! Have you looked online? Thanks for the post. I was hoping to find the pattern for the finished apron. The link that appears near the end of the post links back to this post. So I’m not sure if I am missing something. Any help would be appreciated! Thank you!